In spring 2014, the Board of Directors of the National Association of Student Financial Aid Administrators (NASFAA) convened a Public Service Loan Forgiveness (PSLF) Task Force, comprised a geographically diverse group of financial aid professionals from all types of postsecondary institutions, to develop recommendations for improvement and to strengthen the PSLF program. In June the NASFAA Board accepted and endorsed the recommendations provided by the task force, detailed in this final report. 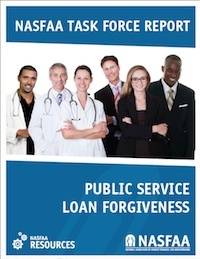 The Public Service Loan Forgiveness (PSLF) program was established in 2007 to encourage student borrowers to work in the public sector. Qualifying borrowers may have their Direct Loans forgiven after 10 years of full-time service in an eligible job. Currently, qualifying employers include federal, state, or local government agencies and tax-exempt 501(c)(3) not-for-profit organizations.